Infrared cameras forced to stay in “night mode” show that black leopards share a similar feature with their tawny counterparts: spots. From the frozen forests of Russia to the scorching sands of the Kalahari Desert, leopards are the most widely distributed large cat on earth. Their iconic spotted coat has been admired and coveted by humans for millennia. But in one part of their vast range—the Malay Peninsula—leopards look entirely black. The findings will offer a new tool to help save the endangered animal, wildlife experts say. Camera traps are increasingly being used to study rare and elusive wildlife, particularly in tropical rainforests. But a simple tweak to the camera traps has produced astounding images and video of complex patterns of spotting on seemingly all black leopards. The black coloration known as melanism—the over development of dark-colored pigment in the skin and the opposite of albinism—makes it nearly impossible to identify individual animals. For this reason leopard populations in Peninsular Malaysia have been difficult to study. Ecologists can now use the spots to identify different animals and begin to estimate the population size of the species. “Because their uniformly black color prevented us from identifying individual animals and thereby estimating their population sizes, very little was known about leopards in Malaysia,” says Mark Rayan Darmaraj, who manages a WWF-Malaysia tiger conservation project. The researchers tested the technique in the Kenyir wildlife corridor in north-eastern Peninsular Malaysia. “We found we could accurately identify 94 percent of the animals. This will allow us to study and monitor this population over time, which is critical for its conservation,” Hedges says. The researchers now hope to use their new method to study black leopards elsewhere. 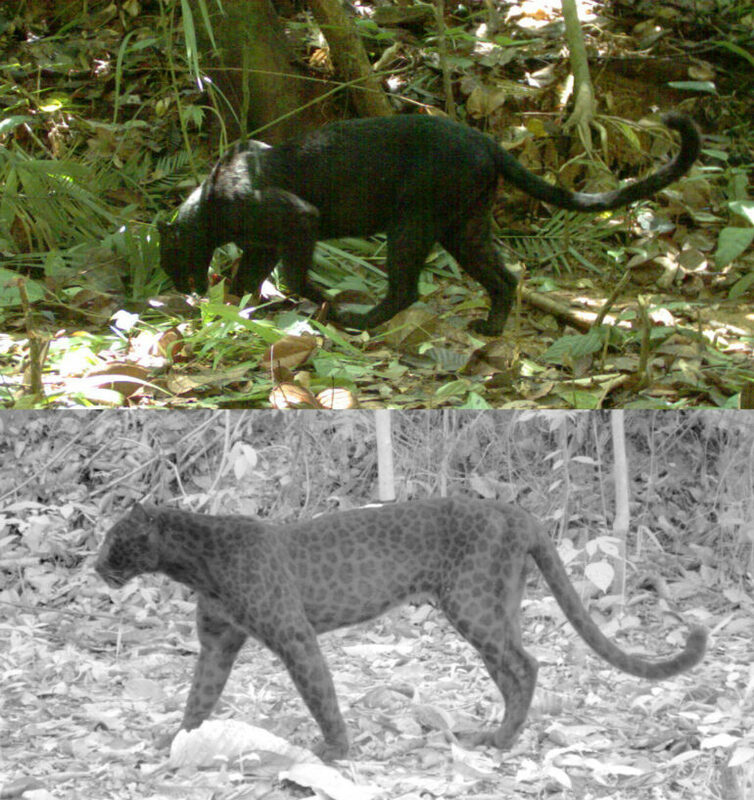 “Some places in Peninsular Malaysia where I have used automatic cameras have lots of prey and forest cover but evidently very few leopards,” says Ahimsa Campos Arceiz. Widespread poaching seems the most likely explanation: Leopard skins and body parts are increasingly showing up in wildlife trading markets in places such as on the Myanmar-China border. Researchers from James Cook University contributed to the study, which is published in the Journal of Wildlife Management.